3nh Color Quality Controller System CQCS3 is supporting software for NH series colorimeter which developed by Shenzhen 3nh Technology Co., Ltd. This software is high-tech software integrating colorimetry, modern optoelectronics and computer science. It provides professional normalization, standardization and data color management solution for modern enterprises. CQCS3 software is connected to the colorimeter with USB cable. You can operate colorimeter through PC. It not only retains the existing functions of the colorimeter, but also extends its functions. 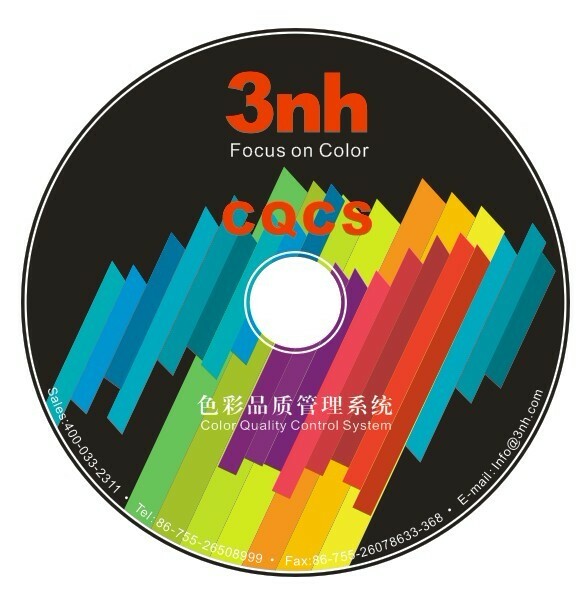 CQCS3 can make color difference analysis, color difference cumulative analysis, color sample database management, chromaticityindex analysis, simulated object color and print, etc. It is the right-hand man of color quality management. ◆ Performing color difference measurement and analysis, obtaining standard and sample data, calculating sample color difference and judge whether it is qualified or not, giving intuitive bias diagram of sample color difference and quantitative data analysis, giving color simulation of standard and sample. ◆ Providing color difference cumulative analysis; selecting different sample data under the same standard and obtaining color simulation comparison diagram; giving color difference distribution graph to help users to judge the variation trend of color difference. Then, the users can better control color changes. ◆ Retrieve Database: can store the desired color data of the sample, and retrieve according to the need to find out the best matching color record.